← Contests With Cash Prizes Are Just Awesome! Blogging is fun and every blogger tries to reach out to newer audience and it is essential for a blog’s growth. Promoting your blog is the next important thing after publishing good content. If you write, readers will come isn’t true. You have to reach out to them to garner their attention. I am always on the lookout for fresh content and new blogs and I add close to 5 new blogs every week. Some of them stay in my feed reader and some of them vanish. I am sure there are many others who do the same. With RSSHugger, now you can reach out to some of those readers looking for new blogs. You might end up increasing your RSS feed(?) subscription numbers a little bit this way. 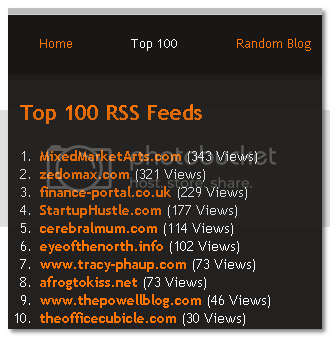 RSSHugger has a Top 100 list of RSS feeds. If you can promote your blog to that list, eventually it will have a positive effect on your RSS subscriber numbers. What if you don’t get ranked this month, no worries the list is reset every month so you have a chance to get listed every month! Even if you are not in the Top 100 right away, you are not totally invisible. There is a ‘Random Blog’ button that gives your blog feed a good chance of showing up. Your blog feed also shows up in the list of 100 new feeds. At the time of writing this post, there is only 268 blogs listed and I say this is a great time to get listed. StumbleUpon is a powerful tool and Matthew has a great tip on promoting your RSS feed. Stumble your RSSHugger Feed page and it sure to convert a few stumblers into your readers. If you already have a RSSHugger page, leave your feed url at Matthews post to get some Stumble love. Update : ShanKri-la has been approved at RSSHugger now! Improving RSS subscribers is a very important task for any blog. How could I say no to an excellent way to reach out to a wider audience through RSSHugger? RSSHugger sounds like a pretty cool service, the only problem is that I don’t really want to spend $20 on it and I can’t exactly post about it because it doesn’t really fit on my blog. I guess I’ll just have to deal without but I do hope that it works for those who try it out. Michael, that is true. $20 is a lot for a new service that doesn’t have established success stories. There might be other options down the line but I’ll definitely talk here about the views I get from there. I am still waiting on their approval for my blog right now. Your rss hugger page didnt work, is it right? Matthew, I submitted my review post this morning but it hasn’t been approved yet! 🙂 I guess you could still Stumble it! I don’t think the URL is going to be different after the approval. Appreciate the effort buddy! Your blog has been approved.